A local Mississippi NBC affiliate reported shocking news Monday morning. "Nooses, hate signs found at Mississippi State Capitol" read the headline of the initial WLBT story, which likewise referred in the body of its piece to "several hate signs … found hanging at the Mississippi State Capitol Monday morning around 7:15 a.m."
It didn't take long for Mississippi officials and politicians of all stripes to denounce the nooses, found the day before the state's Senate run-off. The news quickly spread throughout the national media. Most outlets uncritically passed along the framing that the nooses had been discovered next to "hate signs" and tied the story to the controversy over a joke made by Mississippi Republican Senator Cindy Hyde-Smith that if a constituent "invited me to a public hanging, I'd be in the front row." "On Tuesday November 27th thousands of Mississippians will vote for a senator. We need someone who respects lives of lynch victims." "We want leaders who give honest apologies and can be humble enough to admit when they’re wrong!!!!!" "We’re hanging nooses to remind people that times haven’t changed." "On August 1955, Emmett Till was lynched for allegedly whistling at a white woman." "In Forest, MS, Willie Jones Jr. was lynched for a relationship." "From 1882-1968, Mississippi has had the highest record lynchings [sic] at 581." Who in their right mind saw those signs and made the determination that they were "hateful"? The nooses were rather clearly left by a group critical of Hyde-Smith, her joke, and Mississippi's racist past. I struggle to see how any rational person could judge otherwise. It's difficult to tell from her copy whether it was the WLBT reporter or her sources who described them as "hate signs." But based on the Huffington Post's reporting before the signs were public, I'd suggest that some if not all of the blame has to fall on the department's spokesman, Chuck McIntosh. McIntosh told HuffPost that it’s unclear, based on the signs alone, whether the incident was related to Tuesday’s runoff election between Sen. Cindy Hyde-Smith (R-Miss.) and Democratic candidate Mike Espy, who is African-American. He described the signs—which police haven’t yet made public—as focusing on lynching and Till, a 14-year-old who was lynched in Mississippi in 1955 after being accused of interacting with a white woman. "While I can’t speak to their mindset, it is notable that it was done the day before the special election," McIntosh said. Huh? It is very clear "based on the signs alone" that the incident was tied to the election, given that they explicitly mention the election. He can absolutely speak to the writers' mindsets. Saying only that the signs were about lynching and Emmett Till leaves an entirely false impression entirely. At the very least, the department sat by for eight hours as the false impression that they were "hate signs" went national. WLBT has now edited the body and headline of its original report to remove the "hate sign" designation. Not that a Washington Post reader would know that; "Someone hung nooses at the Mississippi Capitol on eve of racially charged U.S. Senate runoff," still reads their headline. "Authorities removed two nooses and six hate signs found on the grounds of the Mississippi State Capitol on the eve of a U.S. Senate runoff election featuring a black Democrat," reads the lede. There's no mention of the signs' contents. Most (but not all) national outlets have followed WLBT's lead and corrected their initial false reports. But even after the signs were revealed, the national media coverage has been heavily misleading. That the nooses were an anti-racism protest is easily the single most important detail in the story. Ninety-nine percent of readers of a headline or tweet stating simply that nooses were left at the Mississippi statehouse would come away with the impression that it was a hate crime, and not a poorly-thought-out stunt. To omit that detail would be irresponsible, tantamount to a headline stating "Massive Explosion Destroys Downtown Skyscraper" when the body makes clear it was a controlled, planned demolition. As many an irritated journalist will tell you, most readers never bother to read past the headline. A good headline to the story is NBC News' (corrected) headline, "Police investigating nooses hung at Mississippi Capitol to protest state's racial history ahead of Hyde-Smith vs. Espy runoff." But even now, most of the the headlines omit the important context. The AP headline, for example, just reads "7 nooses found by Mississippi Capitol before Senate runoff." 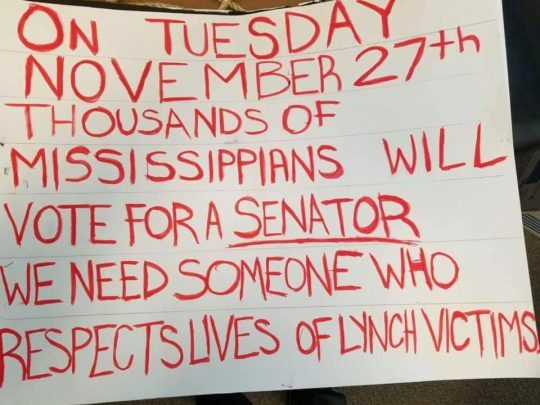 "Nooses and ‘hate' signs left outside Mississippi Capitol in buildup to special election," reads the ABC News headline to a story that in its body notes that "the signs, written in red, black and green—the colors of the Pan-African flag—appeared political, focusing mostly on the special election and high-profile African American lynching victims." That story and headline passing along the "hate sign" designated was published after the WLBT story had been corrected. And then this piece of on-air reporting from CNN's Joe Johns, flagged by Newsbusters. JOHNS: The President defending Hyde-Smith and directly attacking her challenger the Democrat, Mike Espy… The remarks coming hours after a pair of nooses were found at Mississippi's state capitol. Espy supporters hoping to turn anger into turnout. Now purely by coincidence, I'm sure, these are both accurate, and are both very easily misconstrued to suggest the perpetrators are racists. "We are hanging nooses to remind people that times have not changed," is the only sign that can be misconstrued as possibly being left by an angry racist, telling his victims that whites still control the state. One only needs to peruse the comments on the tweet to see that most readers came away with that impression. That wouldn't have happened if CNN ran with, say, "We need someone who respects lives of lynch victims." It's always difficult to judge to what extent media bias can attributed to incompetence or maliciousness. But either way, it's clear the local and national media did a disservice to their readers, especially those who were effectively terrorized by a hate crime that never existed. This entry was posted in Politics and tagged Cindy Hyde-Smith, Fake News. Bookmark the permalink.